Dental implant overdentures, as the name signifies, are dentures that are supported by dental implants. They are more advanced than conventional dentures in that the wearer benefits from firmly fixed false teeth that are not only sturdy, but also have the feel of natural teeth. Implant supported dentures are more popular than conventional dentures or bridges used to replace missing teeth because they are much more stable. Special attachments on these dentures snap on to attachments provided on the dental implants, ensuring better retention. Implant retained dentures are a great alternative for individuals who cannot use conventional dentures. Following tooth loss, the bone that provided support for the teeth can reduce and this might further lead to the receding of the jaw. Here, conventional dentures cannot be used. However, denture implants can be safely and effectively used in such instances. 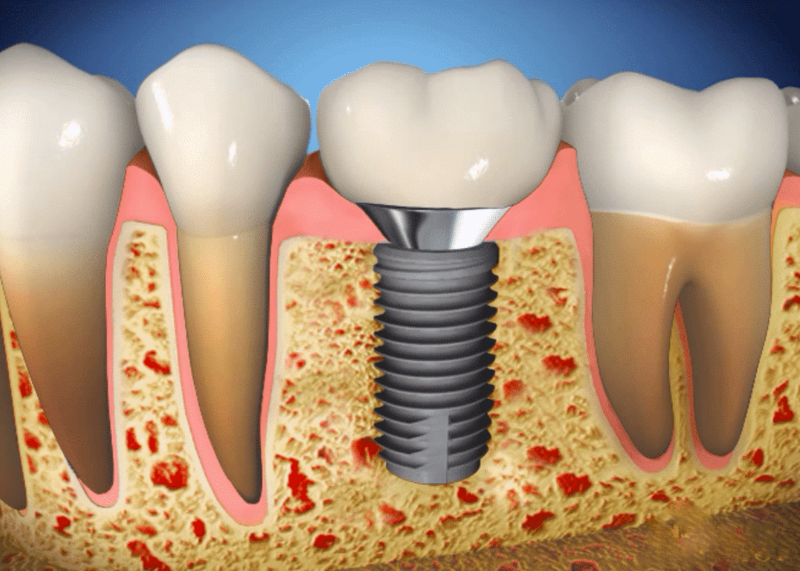 The implants integrate into your bone structure, keeping gum recession and bone loss at bay. Dental implant dentures can be provided for the lower as well as the upper jaw. Two to four implants are used to fix implant dentures in the lower jaw. For the upper jaw, your dentist will provide a horseshoe shaped overdenture, without the plastic covering the roof of the mouth. Four to six implants are placed in the upper jaw, and these are spread out in order to ensure better retention of the dentures. Since the bone density in the upper jaw is less, more implants are required to hold upper jaw overdentures firmly in place. Individuals wearing these dentures will not feel they are using dentures at all. These are more securely fixed than regular dentures. These also have cosmetic advantages. The facial lines that are found around the mouth area of older patients would decrease due to the implants providing extra support to the lips. Implant overdentures prevent bone tissue loss in the jaw that often accompanies teeth loss. Conventional dentures that don’t fit properly can be rather uncomfortable for the wearer, whereas implant overdentures are very comfortable. These do not need the adhesives required to hold conventional dentures in position. Implant overdentures also improve chewing capability. Implant supported dentures are firmer than traditional dentures. There is no risk of the denture becoming loose or falling out of your mouth. They are ideal for individuals who don’t wish to have many individual implanted teeth but would rather go for sturdier dentures. If you plan to use implant overdentures, get in touch with your regular dentist to find out if the treatment is appropriate for you. Your dentist can give you a clearer picture regarding this treatment, and remove any concerns you may have. Some dental implant dentures could last for 20 years or even a lifetime. Factors such as smoking and general health and oral hygiene conditions could have an impact on the durability of dental implant dentures. Dental implant overdentures are suitable for most individuals and are the perfect cosmetic option to replace lost teeth. With implant overdentures you can feel more confident when talking or eating food. Previous articleHGH for Improved Immunity? is it Possible?